Kimbrough Cotton-Patch Blues Festival – FANCY! We return to the FANCY! scene at The Hut in Holly Springs Mississippi May 12-14, 2017 for the Kimbrough Cotton-Patch Blues Festival hosted by Robert Kimbrough Sr. Joined by Little Joe Ayers and a star-studded-line-up of local legends, life long friends and family members. We are proud sponsors of this action packed Cotton-Patch throw down dedicated to the music of local musician North Hill Mississippi Blues legend David Junior Kimbrough. Junior Kimbrough’s infectious music is synonymous with the back woods of Holly Springs in the hills of Mississippi where Junior shared his life with his family. Many of whom still live in the area today and celebrate Junior’s life with the love of his music and cherished memories of his infamous club. Junior’s three sons David, Kinney and Robert continue in their fathers path as brilliant musicians themselves. Deceptively skilled each one is an off-the-chain player. The weekend will provide an imitate environment to experience the blues the way the Kimbroughs do, as a family to ENJOY YOURSELF. LET the corn whiskey flow. ROBERT GONE IT LITE IT UP! Join us for the Kimbrough Cotton-Patch Blues Festival May 12-14, 2017 at The Hut in Holly Springs, Mississippi. Holly Springs is 40 miles South of Memphis in the beautifully haunting hills of Mississippi. A place where the people are passionate about their town, history, music and residents. Hold Up! Robert Kimbrough Sr. got somethin to SAY! 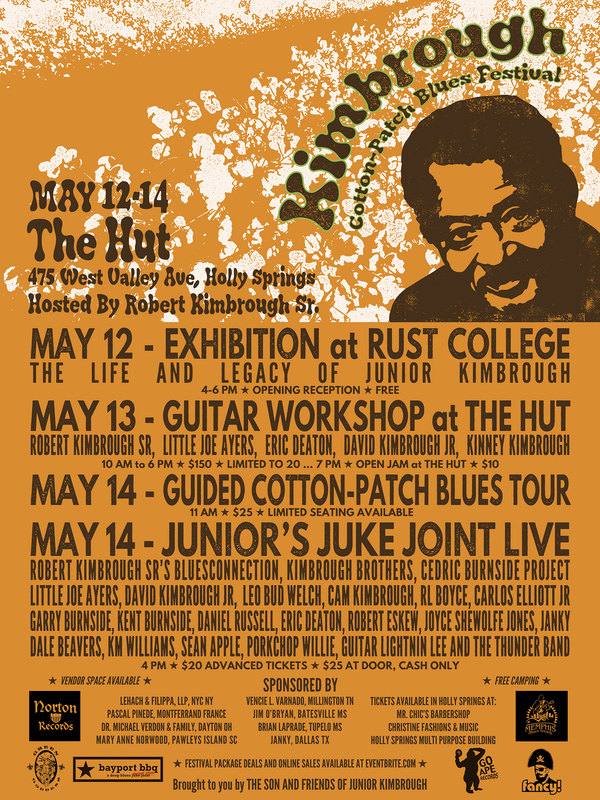 Scheduled events kick off Friday night May 12th, an opening reception for the exhibit The Life and Legacy of Junior Kimbrough at Rust College in the gallery space located in Leontyne Price Library. The exhibition will feature photos by Bill Steber, Yancey Allison, Adam Smith, David Stevens and David Katzenstein whose 1988 photos of Junior’s house party were recently featured in Oxford American. Also photos by famed folklorist Cheryl Thurber. Unearthed live performance footage of Junior and Soul Blues Boys from The Northeast Mississippi Blues and Gospel Folk Festival at Rust College. Obscure live performance and interview film footage from rock writer Jas Obrecht collection. Plus amateur photos, video, candid snap shots, newspaper clippings, magazines, personal items, and collected stories. Many items were generously loaned from the University of Memphis Music Library, University of Mississippi Blues Archive, UNC Southern Folklife Collection at Chapel Hill, Tulane University Special Collections, and Rust College Archive. The exhibit will run until May 31st. Followed by an Open Floor Jam at The HUT. Show up. Plug in. Turn up. Robert gone to LITE IT UP. Food available. An all day guitar workshop with Robert Kimbrough Sr., David Kimbrough Jr., Kinney Kimbrough, Garry Burnside, Eric Deaton, and Joe Ayers. Learn the Cotton-Patch guitar style from the masters themselves. Spend the day with the your heroes and learn from the pros. All of the musician learned and played with Junior. The guitar workshop provides a chance to learn and play along side master bluesmen. Robert and the crew will sit you down and teach the fundamentals of playing the blues and demonstrate their styles in an up-close and personal environment. This is an incredible opportunity to sit and observe and learn from true artists on their own turf. The Kimbroughs, Burnsides, Eric Deaton, and Joe Ayers share an infectious enthusiasm when discussing Junior’s life and music. Generous with their knowledge on the subject of Cotton-Patch Blues Mississippi’s musician deceptively masterful skill effortlessly executed inspires. Keepers and teachers of Cotton-Patch Blues an historic American tradition that flourishes in the North Hills of Mississippi today. They will answer questions, provide instruction and have you jamming with them before the day is done. Join Robert and the band on stage later that evening at The Hut. Beginners and seasoned ax-slingers welcome. Bring your guitar, a desire to learn and your appetite. Food will be available! Followed by a Saturday Night Jam. A “Real” Juke Joint Night. Nothing FANCY! but the Blues. Cheap beer, great burgers, plus LIVE hot blues. Jam along, all night long with local artists and Cotton-Patch Blues Country legends. Sunday morning meet up at The Hut for a hearty country breakfast with Robert and Joe before embarking on a guided historic tour around Holly Springs. Visit sights significant to Junior’s life: Junior’s home he shared with his sons, Marshall Scrubbs Club, Sammy’s Rib Joint, Junior’s club Chulahoma location, Hyw 4 East home, Hyw 311 House Party location, Junior’s grave and The Blues Marker dedicated to Junior in the Square. Outdoor stage. Food and beverages available. West Valley in Holly Springs, off of NW Boundary St.
Includes all day guitar workshop, play alongside the Blues masters Saturday night at The Hut, guided blues tour, and entrance to Sunday Night at Junior’s. Entrance to The Hut Saturday and Sunday, and reserve seat for guided tour. Buy your ticket online early for Sunday Night at The Hut for the recreation of Junior’s. Mr. Chic’s Barbershop 673 Martin Luther King Jr Dr.
Christine’s Fashions & Music 239 Martin Luther King Jr Dr.
Holly Springs Multi Purpose Building 235 N Memphis St. Enter your address to subscribe and receive new posts by email.